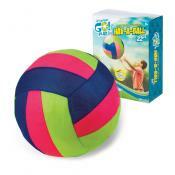 Super lightweight ball with a brightly colored, highly textured woven fabric outer cover. At 22 inches its size facilitates bilateral hand/arm use for catching. Great for bouncing off the floor or the wall. Requires needle pump to inflate which is provided.